PHOENIX (March 6, 2018) – The Higher Learning Commission has approved Grand Canyon University’s application to become a non-profit institution — a major step in the process to return the University to its historical roots. 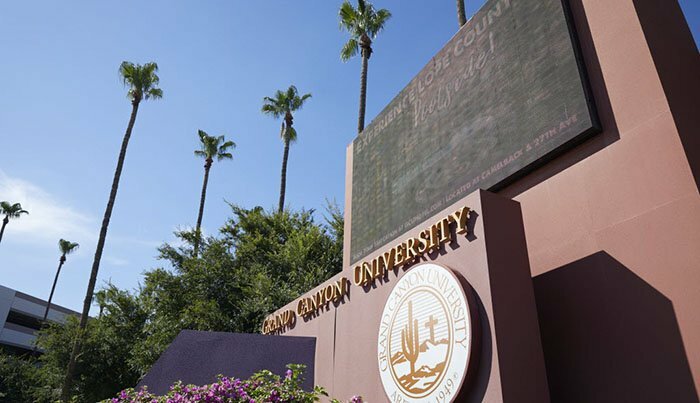 As part of the transition, GCE will sell certain academic-related assets to a non-profit entity that will carry the Grand Canyon University name. Following the sale, GCE will operate as a third-party provider of educational and related services to GCU and potentially, in the future, to other universities. The structure is similar to that at hundreds of non-profit universities in the country that outsource services to third-party providers. This release contains “forward-looking statements,” including statements relating to the proposed transaction discussed above. Words such as “may,” “should,” “could,” “would,” “predicts,” “potential,” “continue,” “expects,” “anticipates,” “future,” “intends,” “plans,” “believes,” “estimates” and similar expressions, as well as statements in future tense, identify forward-looking statements. Forward-looking statements are based on information available at the time those statements are made or management’s good faith belief as of that time with respect to future events, and are subject to risks and uncertainties that could cause actual events to differ materially from those expressed in or suggested by the forward-looking statements. Important factors that could cause such differences include, but are not limited to: the failure of the proposed transaction to be approved by any of our regulators or accreditors or to satisfy any conditions set forth in any such approvals; the failure of the GCE and GCU to reach agreement on key terms of the proposed transaction and to execute definitive agreements; the possibility that any or all of the various conditions to the consummation of the proposed transaction that may be set forth in definitive agreements may not be satisfied or waived, including the failure to receive any required regulatory approvals from any applicable governmental entities (or any conditions, limitations or restrictions placed on such approvals); the occurrence of any event, change or other circumstance that could give rise to the termination of any definitive agreement once executed; the effect of the announcement or pendency of the proposed transaction on our ability to retain and hire key personnel or operating results and business generally; risks related to diverting management’s attention from ongoing business operations; the risk that stockholder litigation in connection with the proposed transaction may result in significant costs of defense, indemnification and liability; and other factors discussed in the GCE’s reports on file with the Securities and Exchange Commission. Factors or events that could affect the transactions contemplated herein or cause actual results to differ may emerge from time to time, and it is not possible to predict all of them. We undertake no obligation to publicly update or revise any forward-looking statement, whether as a result of new information, future developments or otherwise, except as may be required by any applicable securities laws. Congratulations Dr. Mueller on winning the first stage of GCU’s HLC proposal! Congratulations GCU, I’m so proud to be a part of the GCU doctoral community!